Giving hand made gifts is a favorite pastime of mine. Spring and summer bring Easter, Mother’s Day and lots of birthdays, graduations and weddings. Etched glass gifts are a popular, (but often pricy) option for gift giving. 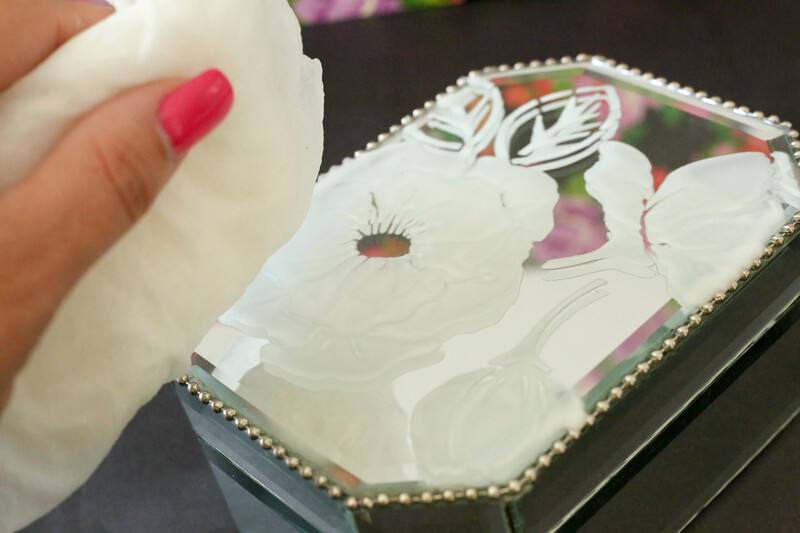 Can you believe I created this etched mirrored jewelry box in a matter of minutes? I’ve seen many beautiful etched glass pieces in family collections and gifts. Recently, I was introduced to the process of etching glass with etching cream, and I fell head over heels for this fun, easy to use product called etchall. 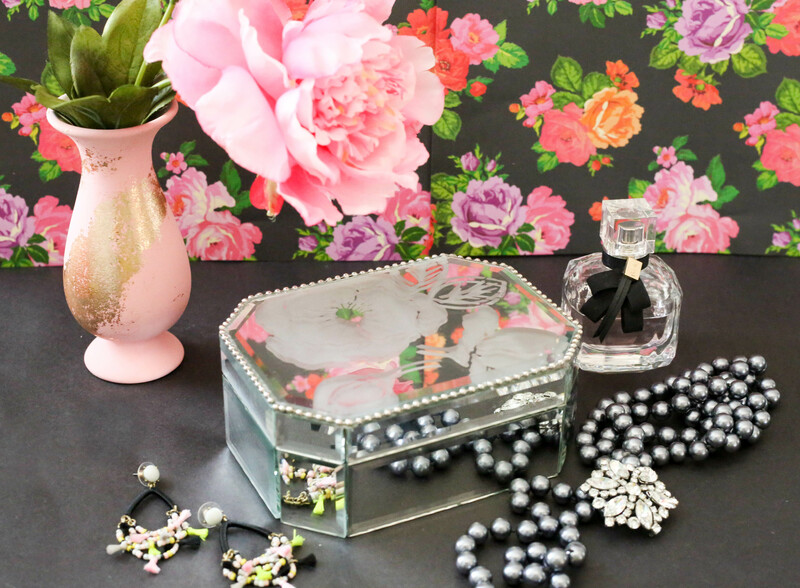 Making this jewelry box was so simple, I highly recommend glass etching to anyone who likes their crafts quick, easy, and mess free. 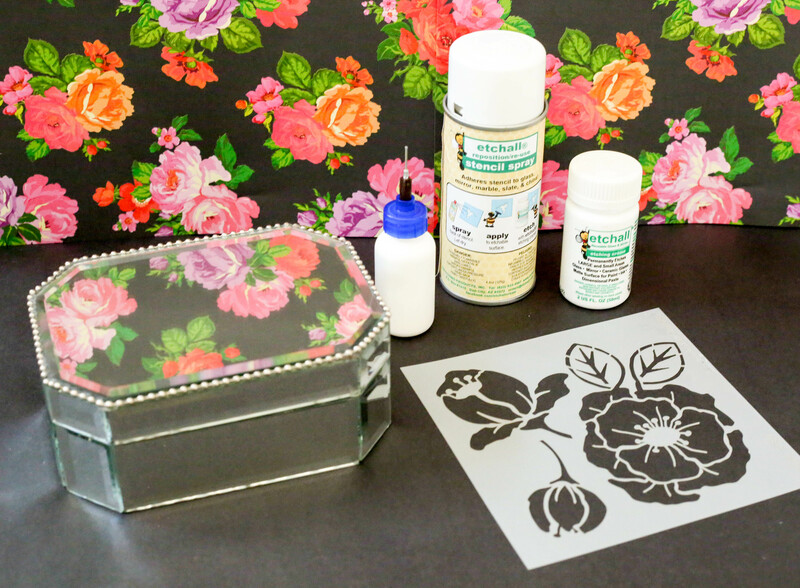 I love this bold floral stencil from Stencilgirl Stencils. It was the perfect size and scale for my project. You might remember their name from a previous post where I created a gorgeous vase using their Geometric Sky stencil. 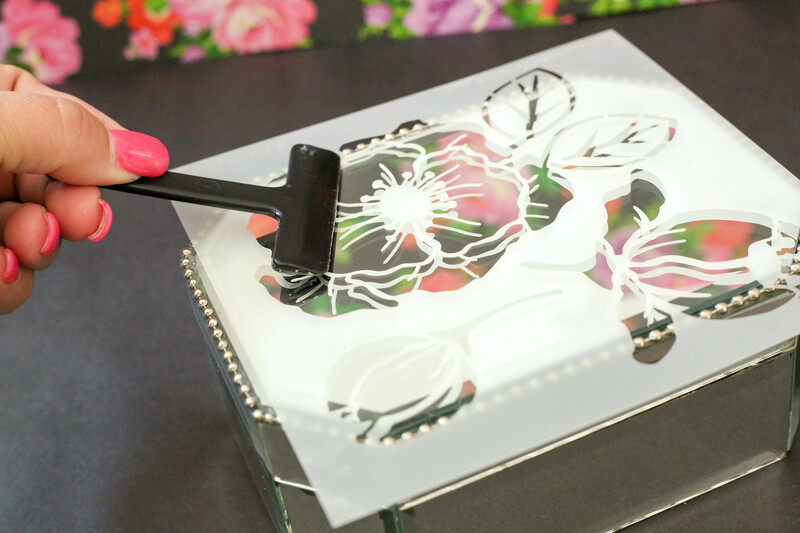 I sprayed the Woodcut Roses Stencil with the etchall Stencil Spray, and adhered it to the top of the jewelry box with the squeegee tool to ensure a good strong seal. I applied etchall Etching Cream and allowed it to set for about fifteen minutes. The etching process begins right away so it’s imperative to work efficiently in this step. 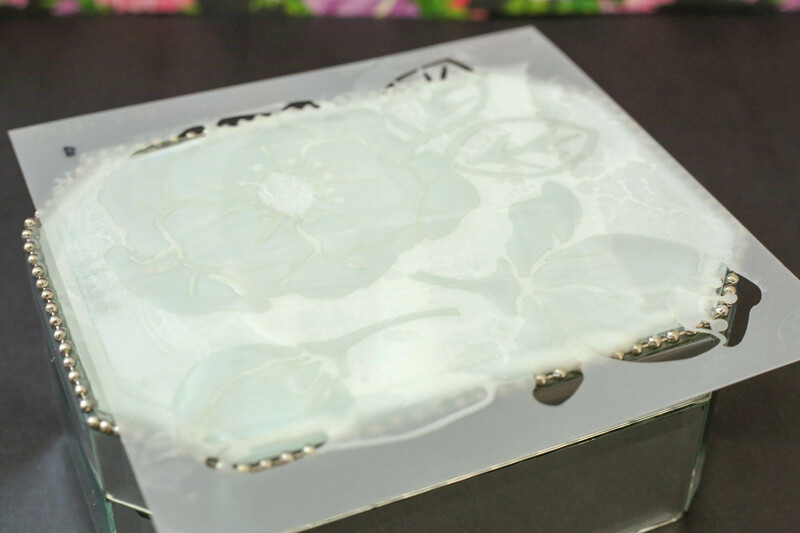 A thorough removal of the etching cream using wet cloth followed by dry cloth revealed the transfer of this gorgeous rose design onto the mirrored surface of the jewelry box. 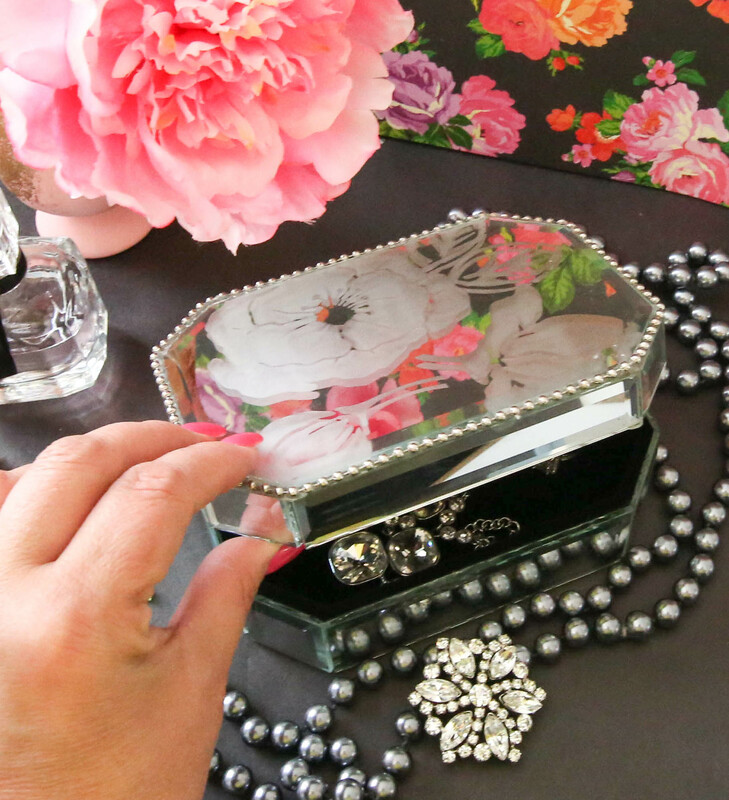 This stunning mirrored jewelry box is a beautiful gift for Mother’s Day, a wedding or bridal shower or birthday. Select stencils that reflect your style and the season. With etchall and the right stencil, the possibilities really are limitless!